Having our own family milk cow means we normally have a lot of wonderful raw milk on hand. Besides drinking it and making kefir or yogurt an easy way to use the milk is the following mozzarella cheese recipe. Mozzarella is an Italian cheese which is quick, easy and fun to make. We enjoy eating it fresh, as well as on pizza and in lasagna. Be sure to try it on Homemade Wheat Thins! Made fresh, it stores in the refrigerator for a couple of weeks and in the freezer for several months. 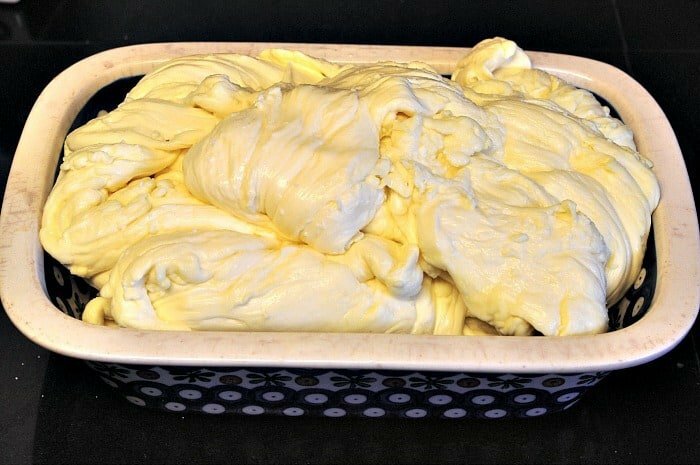 Unlike other cheese making processes, the mozzarella cheese recipe calls for heating the curds to 170 F and then stretching it like taffy – who hasn’t heard of an old fashioned taffy pull? Well, I never took part in one but pulling mozzarella cheese reminds me of what they must have been like! This pulling and stretching gives the mozzarella cheese the stringiness it is famous for. Mozzarella cheese is also one of the easiest soft cheeses to make! I have found that the process of making Mozzarella cheese is very forgiving. I use to be careful to use milk that was at least 3 days old as many recipes require – As milk sits, the acidity increases which allows the cheese to stretch. But, I have found with the milk Emme gives this waiting period is unnecessary. Before getting started, be sure to check out Cheese Making Basics for helpful tips, supplies and ordering information. If you are interested in cheese making, I would highly recommend the book, available from my affiliate partner, Home Cheese Making by Ricki Carroll – it is an excellent resource. **** To make a 4 gallon batch use 5 tsp citric acid and 1 tsp rennet. Pour milk into pot, sprinkle with citric acid and stir well. Milk must be cold or the citric acid does not work well. Heat milk to 88F – 90F over medium heat. If you overheat – just let it cool back down! Pour dissolved rennet into the milk while stirring. Stir slowly and after a few minutes, the milk will begin to thicken. Globs of white curd will separate from the liquid (whey). If it doesn’t coagulate immediately, let the milk sit for about 30 minutes. 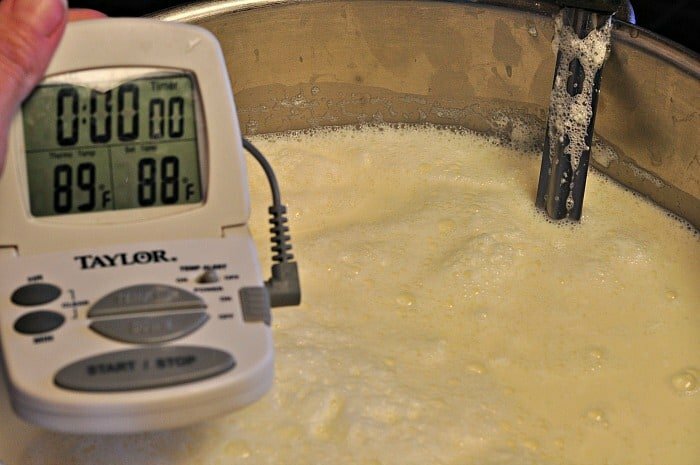 Once the milk has coagulated and the whey separated, turn heat to high and heat milk to 110F. Place a colander over another pot and pour or spoon out the curds into the colander. Continue to heat the whey. 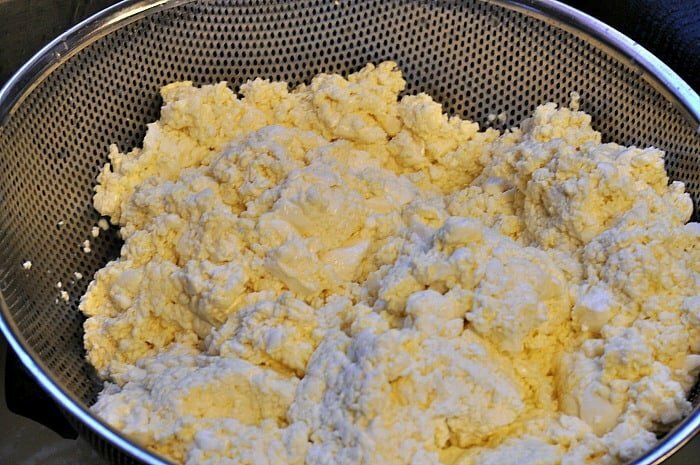 Press whey out of the curds in the colander. 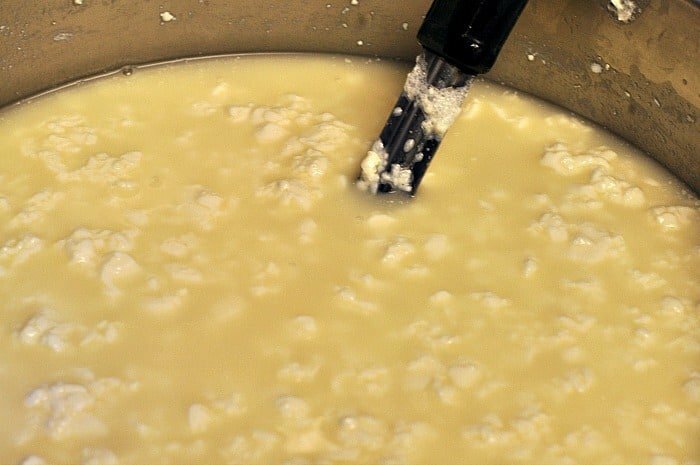 Place the curds back into the pot of whey and heat until 120 F.
With a spoon, lift the curds out of the whey – cool a few seconds, if necessary, and begin pulling and stretching it into a rope. The cheese will break apart at this point if it is not hot enough – just put it back into the whey and let it heat further. After stretching it into a rope, return it back into the whey to heat back up. Once heated again, stretch it again. Continue this process several times until it takes on a shiny, soft and smooth appearance. The photo above is from the first stretching and as you can see it is tearing on the left side. It needs a few more stretches. It should be ready by the time the whey reaches 150F – 160F. (If the whey gets too hot, the cheese will melt into it.) As the whey heats to higher degrees be sure to protect your hands and use gloves – it is hot! You will know the mozzarella cheese is done when it no longer breaks and tears during the stretching process – it also becomes shiny and smooth in appearance. Once stretched enough, pour 4 tsp (may use more if desired) salt on the counter. 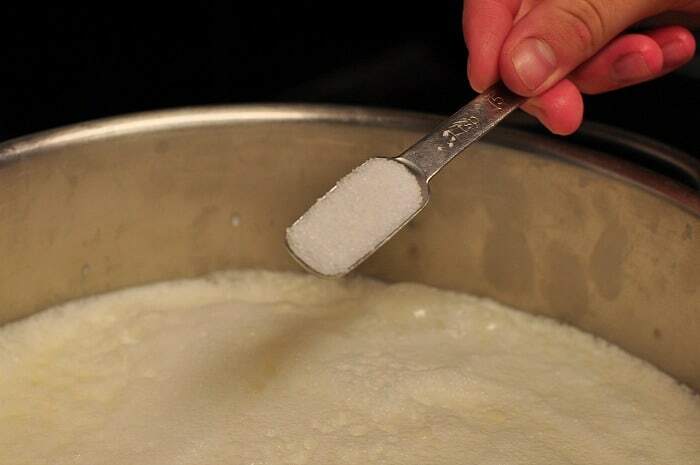 Remove mozzarella from the whey and place it on the salt. Knead the salt into the cheese but work quickly as it must be hot to absorb the salt. 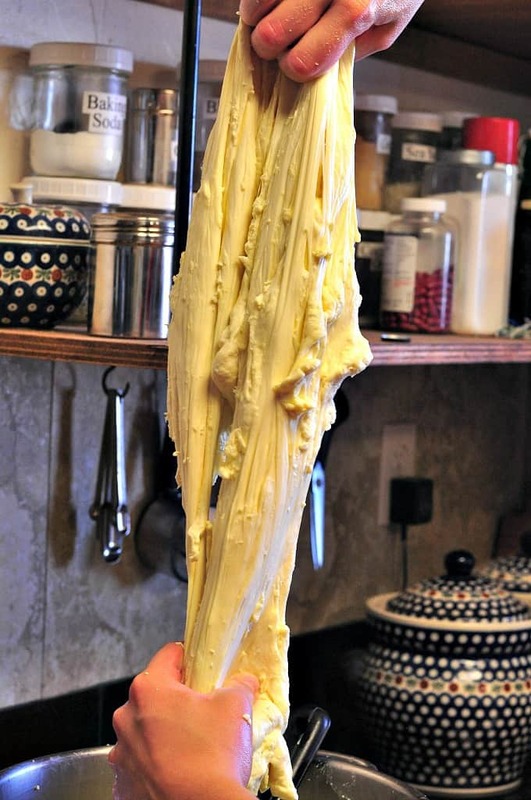 Place the cheese back into the whey briefly until it is hot. Remove and roll into a log or place in the desired container. Sometimes when I am feeling lazy, I just sprinkle the salt over the cheese as I am holding it and work it into the Mozzarella – this works too! I make 4 gallon batches and place it into a rectangular dish similar to a loaf pan. Once chilled, we either eat it fresh with crackers or grate and freeze it. As you can see from the photo below, this batch is intended for grating so I am was not so concerned about the finished appearance – I just plopped it into the dish! After thoroughly chilling in the refrigerator, I will grate this batch and we will have pizza! Another cheese you might be interested in trying your hand in is Feta Cheese! To make a 4 gallon batch use 5 tsp citric acid and 1 tsp rennet. Heat milk to 88F - 90F over medium heat. If you overheat - just let it cool back down! Stir slowly and after a few minutes, the milk will begin to thicken. Globs of white curd will separate from the liquid (whey). If it doesn't coagulate immediately, let the milk sit for about 30 minutes. 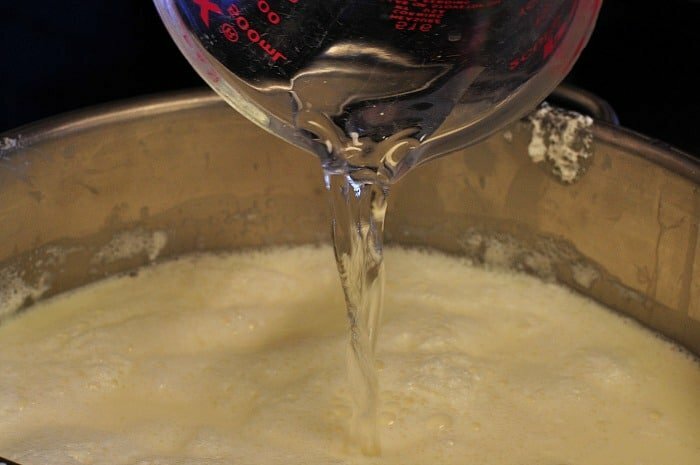 With a spoon, lift the curds out of the whey - cool a few seconds, if necessary, and begin pulling and stretching it into a rope. The cheese will break apart at this point if it is not hot enough - just put it back into the whey and let it heat further. Once heated again, stretch it again. Continue this process several times until it takes on a shiny, soft and smooth appearance. It should be ready by the time the whey reaches 150F - 160F. (If the whey gets too hot, the cheese will melt into it.) As the whey heats to higher degrees be sure to protect your hands and use gloves - it is hot! You will know the mozzarella cheese is done when it no longer breaks and tears during the stretching process - it also becomes shiny and smooth in appearance. Once stretched enough, pour 4 tsp (may use more if desired) salt on the counter. Remove mozzarella from the whey and place it on the salt. Knead the salt into the cheese but work quickly as it must be hot to absorb the salt. Place the cheese back into the whey briefly until it is hot. Remove and roll into a log or place in the desired container.